Finding used appliances in St Louis just got easier. 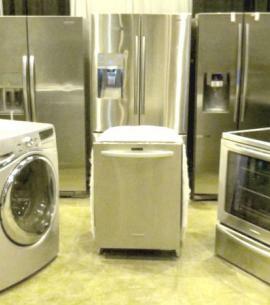 The St. Louis Appliance Outlet has expanded its inventory of used appliances and has opened their second location. This new St. Charles appliance store carries a large inventory of quality used appliances. Now you can shop at either of the Appliance Store locations 7 days a week or online anytime to find used appliances at a discount of 20% to 50%. You will find hundreds of models on display, and the selection changes constantly as appliances arrive by the truckload. If you don't see the one you're looking for, let us know and we can help you find what you need - it could arrive any time. Check with us often as we receive limited quantities of each model. Buying used appliances in St Louis can save you a lot of money. Home appliances can be a large investment and sometimes you need to replace yours unexpectedly. We understand that sometimes it just isn't in the budget to buy a new high-end appliance at retail prices. That's why we have opened our second used appliance store in St. Louis to offer quality used appliances at outlet prices. In fact, shopping our used inventory can enable you to get a better appliance at a lower price than shopping at retail appliance stores. At our St. Louis used appliance stores, you don't need to settle for a cheap refrigerator, dishwasher, or laundry set; you can get high-end appliances, even stainless steel appliances at huge discounts. We have used refrigerators starting at $399 and used appliances starting at $125. Everything we sell comes with a 90-day warranty with extended warranties available. We inspect and refurbish everything before putting it on our showroom floors so you can shop with confidence. We provide delivery and haul-away services and financing is available. While you are shopping our appliance store for used appliances, consider our other discount appliances. You always save on name-brand premium products, both new and used. We buy discount appliances that are discontinued models, open-box, returns or overstocks. All are new, but with damaged crates or boxes and sometimes cosmetic damage, at substantial markdown from manufacturers like Samsung, GE, Whirlpool, LG, Maytag, and Kenmore. Once we purchase the appliance, we quality inspect the product to verify condition. We offer these cheap new appliances to our customers for steeply reduced prices, with discounts of 20-50% of the retail prices. Much of our discount appliance inventory consists of floor models and display models from major retailers. In addition to these floor models, we also receive overstocks and discontinued models. These are brand new appliances that we offer to our Saint Louis area customers at prices 20% - 50% below retail. Come in to our stores in Maryland Heights and St. Charles to see these premium appliances. Open Box Appliances are not lower-end or cheaper products simply because we sell it at a discounted price compared to our competitors. The cheap appliances that we sell are generally mid- to high-end luxury appliances – so in this case “cheap appliances” is only referring to the low price and great discounts. We do sell low-end appliance brands like Hotpoint, all the way up to the prestigious Electrolux Icon and GE Monogram lines and some of the most popular new refrigerators from Samsung and LG. You can easily get luxury, premium, and mid-line appliances that we sell, for unbeatable savings. We have two convenient used appliance stores to serve the Saint Louis Metro area: Saint Charles and Maryland Heights. We can also deliver your used appliances to your home and have your old ones hauled away. We offer a 90-day warranty and extended warranties are available. Financing is also available. Shop our appliance stores 7 days a week or our web site any time.